Your ads are now running. Because of a technical issue, some of your campaigns might have mistakenly resumed running on May 31, 2012. You might also have received an email titled, "Google AdWords – Your ads are now running." We’ve fixed this issue and are crediting your account for the amount you accrued. Once it’s been applied, the credit will appear on the Transaction history page, located on the "Billing" tab of your AdWords account. 1. Sign in to your AdWords account at https://adwords.google.com. 2. Click the "Billing" tab, then the "Billing settings" link on the left. 3. Find your disabled form of payment on the page. 4. Check that the payment details are correct, then contact your bank or credit card provider to see if the form of payment can be used. 5. Click the "Re-enable form of payment" link to make it usable again. After you re-enable your form of payment, your ads will start to run again. Keep in mind that once you re-enable your form of payment, you may be billed for unpaid advertising costs that you accrued before this error. We apologize for the technical issue, and thank you for understanding. You’ve received this email to update you about important changes to your AdWords account. There are three main reasons I wanted to share this post with you. When you manage many Google AdWords accounts, you always want to take proper precautions with paused accounts/campaigns. If you have paused a campaign and don’t anticipate reactivating it in the near future, make sure to set a really low budget (I recommend $1/day). That way, you have a safety measure in place in case something ever happens. Sure, it’s likely you will get a refund if Google (or adCenter) ever makes a mistake, but why worry when you can mitigate risk. Also, you never know when that refund may come and you don’t want to have any cash flow issues should it take a while to process the refund. Second, I wanted to share this post because it’s probably a good time to look through all of your old accounts and campaigns on Google AdWords. Do a thorough audit on Monday. Make sure to check if anything got reactivated accidentally. If yes, make sure you get the proper refund you are entitled to. Third, always make sure to have an up-to-date email address in your search engine accounts. If your email is not up-to-date, you may be missing such messages. Hope you are having a super weekend! A while back I wrote about Six Essential Campaign Checks. These Google AdWords and Microsoft adCenter checks are just a few of my favorite daily checks. Today, I wanted to highlight some important Google AdWords campaign-level checks that I like to perform every few months (typically every quarter). These checks will often yield some great quick wins in optimizing your PPC account, especially if you have a large team, big budget, and complex program. I’m a huge fan of sitelinks. 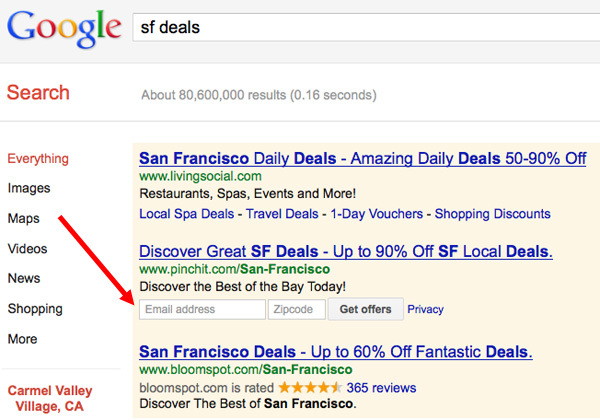 Now, Google is displaying up to Six Sitelinks in paid search. However, if your campaign is missing sitelinks, they won’t deliver! Make sure to regularly go through your AdWords campaigns to verify that they all have at least six sitelinks. These days, Google offers several ad rotation options: rotate evenly, optimize for clicks, and optimize for conversions. Rotate evenly is rarely the right setting, unless you are testing ad copy. Sometimes, after tests have concluded, we all forget to return the settings to optimize for clicks or optimize for conversions. This optimization is super easy: Check your campaign settings and make sure the ad rotation settings are consistent and correct. When I’m testing a new campaign, I like to leverage a low budget (maybe a few hundred dollars/day). Once a campaign is proven, however, I like to raise budgets and change my delivery method to accelerated. Make sure to audit your campaign settings: Did you forget to move over from standard to accelerated? You never want to cap the delivery of a highly profitable, proven campaign (that is, unless you truly have a limited budget to work within). Also, while you’re at it: Make sure your budgets are set correctly. Great performing campaigns can easily outgrow old, small budgets. Google seems to get more and more aggressive with its (expanded) broad match over time. As a result, I’m spending more time and getting amazing results deploying new negative keywords. Sometimes when I generate new negatives, I may add them to the campaign which helped generate them. However, if you block a bad query in one campaign, it could always pop up in another. From time to time, make sure you have parity in your campaign level negatives across all your campaigns. Of course, there always will be a few exceptions (and it’s important to keep track of those so you don’t mistakenly deploy them to other campaigns). Settings can make such a difference in your campaign’s performance. As just one example, I like to separate out tablets and smartphones (rather than blend them into my desktop campaigns). Sometimes, however, settings can get mixed up (especially with a rapidly growing/changing account). 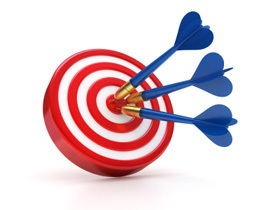 Make sure your targeting settings are correct and you can instantly improve your bottom line. 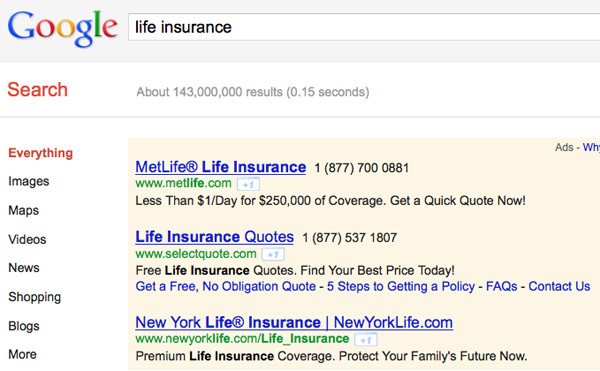 Check out the screenshot below of the Google search results for the ever competitive query, “auto insurance”. At the top of the right rail, you’ll see a map. If you click the title of the map (“Map for auto insurance”), you get taken to a local results page that includes local brokers. If you’re a local broker, this could be a great way to get more business. However, if you’re a paid search advertiser and show up on the right rail, this means lower CTRs. The map pushes all ads on the right rail down. At the end of the day, this means it’s more important than ever to show up in the top yellow bar. Otherwise, your ad will get a significantly lower CTRs. Google is supposed to normalize CTRs for position for purposes of quality score, but I wonder if they are factoring in this new map feature. The lower CTRs of right rail advertisers could be a vicious cycle if Google is not taking this new map feature into account. My advice: Work on your CTRs, landing pages, and overall account structure/efficiency to make sure you show up in that top yellow bar! It’s becoming more important than ever to avoid the right rail, if possible, and show up in the yellow bar. I’m a huge fan of Google AdWords ad extensions. What are ad extensions? They are new ways of customizing your AdWords ads to greatly improve your overall CTR and interaction with searchers. Basically, Google is challenging the traditional paid search ad format with new, special extensions that make your ads more interesting and interactive than ever before. Different ad extensions make sense in different verticals. Some of my favorite examples from the finance vertical include Call Extensions and Sitelinks. In the retail vertical, you may quite familiar with seller review extensions. Recently, I noticed another cool ad extension that’s still in beta testing, email lead capture extensions (check out the screenshot below). For many verticals, the money truly is in the email list. This is never more true than in the “daily deals” vertical. When I search for “sf deals”, I found a neat ad by Pinchit that allows me to sign up for their email deals without ever leaving Google AdWords! If you make a lot of money from your email list, I highly recommend asking your AdWords rep about this extension. If you’re in a vertical that is not as reliant on your email list, I highly recommend testing the other extensions, you will not be disappointed. Great work Google, please keep the cool ad extensions coming. Are You Leveraging AdWords Call Extensions? Check out the screenshot below. I really like the MetLife and SelectQuote ads. Why? They leverage Google AdWords call extensions. Also known as desktop call extensions, these ad extensions offer a neat way for advertisers to display a phone number in their AdWords ads outside of descriptions lines 1 and 2. They are incremental to your existing AdWords ads and provide a great way to connect with users. If you’re set up to handle customer calls and conversions via phone, I highly recommend giving AdWords call extensions a try. Following are a few quick facts. AdWords call extensions work for both top, yellow bar advertisers as well as right rail advertisers. They work for everyone. They used to be free during the beta testing period but now cost money. Each call starts at $1. When you enable call extensions, you will activate a few new columns in your AdWords interface that display the number of phone calls and phone through rate (PTR), a metric very similar to click through rate (CTR) but for phone calls. Google displays its own number and then forwards to the number you enter in your ad extensions setup. That’s how Google measures the number of calls and charges you. To the best of my knowledge, phone calls do not count towards your overall CTR nor quality score at this time. If you get a ton of calls (and see fewer clicks as a result), you may experience a lower CTR and therefore quality score. That said, the economics may still make sense. You just need to model it all out and test both scenarios. In the future, calls may count towards your quality score. Call extensions only show up for ad groups that got at least 30 clicks in the last 30 days. They do not display for lower volume ad groups. It’s my personal belief that call extensions add a lot of credibility to ones ad. I actually believe they can improve your CTR. Just having the call extensions number present shows that you mean business and you’re legit. This trust factor can really draw attention to your ad and make it look appealing. In my opinion, it’s a true winning situation and an ad extension that must be explored by all major AdWords advertisers. Are you currently leveraging call extensions in your AdWords campaigns? Google is on a roll – 2011 is a year of change when it comes to AdWords. I’m talking about front end changes that directly impact user experience. Just a few recent examples: Six Sitelinks In Paid Search, Light Blue Google Search Results, and AdWords Megatitles. Today, I’m thrilled to blog about a few recent changes to Google AdWords display URLs and how you can benefit from these changes. Check out the screenshot to the right. You can see that the display URLs are now right under the title, followed with description lines one and two. In the past, the title would always be directly followed by the description and then the display URL at the bottom. Most users focus primarily on the title. Now that the display URL is so close to the title, it’s more important than ever. Users are going to focus on your display URL more than ever before. My recommendation: Consider modifying your display URL to include relevant keywords (either as a subdomain or as a folder after the root domain). In the screenshot to the right, I personally like the Allstate ad since “Auto-Insurance” really stands out as a folder after the root domain in the display URL. Another recent change to display URLs on AdWords (a few months back): Display URLs are now in lower case. You can no longer have title casing in subdomains and also root domains of display URLs. However, there’s one exception: folders. Check out the esurance ad to the right, the folder “California” is in title case. Now, check out the ad for insure.com. The “autoinsurance” is in lower case. A while back, it was possible to leverage title case in subdomains and root domains, such as “AutoInsurance.Insure.com”. My tip: Make sure to test both subdomains and folders. As you test folders, make sure to test both lower case and title case. Personally, I have found great success with title case and feel it will be even more important now that display URLs are right below the title. So there you have it. A few recent changes to display URLs and a few tips on how to optimize the CTR of your ads. Hope this helps. Any special display URL strategies that have worked well in your AdWords campaigns? I love Google! How couldn’t I? AdWords has fueled my online marketing career. Another reason I’m a huge fan, however, has nothing to do with my personal online marketing career. It’s really just the simple fact that I love innovation and Google keeps innovating. Back in August, Google really started innovating with their new AdSense formats. I’m an AdSense publisher and my personal earnings improved handsomely as a result of the new AdSense formats. Just recently, I’ve seen some major tests in the AdWords landscape as well! In short, Google is testing a new AdWords format where D1 is in the title, if you’re a top bar advertiser. This test could have some really big implications on large paid search advertisers! Check out the screenshot below. In the amazingly competitive auto insurance industry, you’ll see that D1 is now part of the title for the top three top bar advertisers. This is really interesting because it’s all about the title. When it comes to paid search ad copy, the title is your single biggest leverage point. Adding more real estate to the title adds a new world of opportunity for AdWords advertisers and is likely to improve CTR quite a bit. So what can you do? Keep a close eye on your campaigns. Right now, it appears Google is just testing this new format on a very small percentage of their traffic. I only get it once in a while. However, if this new format starts spreading, you may want to re-think your ad copy strategy to further optimize your new mega titles! Also, you’ll want to prepare yourself for a large potential influx of paid search clicks. The corporate world of pay per click search engine marketing is very exciting. One of the reasons it’s so exciting is the budgets are unreal. When you’re managing the kind of money I am, there’s always a reason to be excited (and on your toes). I often get the question, "Ian, how much money do you spend on Google AdWords and other large search engines?" Unfortunately, I can’t answer that question. However, today I’ve got the next best thing for you, information about what the top advertisers spent on Google in the month of June. But, before we get started, I want to thank my pal Robby for sending me the idea (and article) behind this post! BP went crazy and ramped from minimal spend to $3.59 million in June. What really excites me about BP’s spend is the fact that it’s all about branding. Branding gets such a bad reputation in the world of online marketing, but I’m here to say that it’s the future. I’ll explain why a bit later! AT&T Mobility spent $8.08 million in June, coming in as Google’s number one spender. 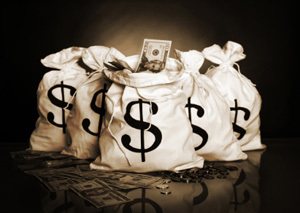 Apollo Group (the folks behind University of Phoenix) came in as number two with $6.67 million in spend. I was actually a bit surprised to see them that high on the list. I know a number of great people working at this company and can’t say enough good stuff about them! It was interesting to see Living Social on the list with $2.29 million in spend. I haven’t heard much about these guys, they seem to have come out of nowhere, definitely a company to keep an eye on. I do wonder about the accuracy of this list. There are some names I expected to see on the list which are not there. Nonetheless, the data for the companies listed does seem plausible based on my six years of corporate PPC experience. In any event, I think it’s useful in terms of being directional. One of my favorite parts of AdAge’s article: BP spent $3.59 million on AdWords in June. All of this spend was pure branding. In my opinion, PPC is all about direct advertising right now. Most savvy companies are making a positive margin on their PPC spend. This is a good thing and it’s what we get paid to do. However, when you start looking at the statistics, online advertising is still a smaller percentage of most big company advertising budgets. As these budgets continue to shift online, margins for many advertisers will get thinner and thinner. (I’m talking in aggregate here, of course there will always be super profitable niches.) Online will become more about branding. It makes perfect sense to me: At least BP knows how many clicks they are getting on AdWords (a proactive activity) versus offline impressions (which is a passive activity). Now, you could look at this in two ways. If you’re a direct advertiser with really high margins, you could see it as glass half empty and worry about evaporating margins. (I wouldn’t look at it this way. As long as you don’t sit still and remain savvy, you’ll find a way to continue to squeeze out margin. If you squeeze margin out of a difficult environment, you will be the rock star of your company.) If you’re a glass half full type of person, this creates a world of opportunity for continued success in the online marketing career path! 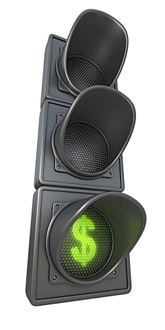 More money spent online means more opportunity for all of us in the corporate PPC world. Moreover, it creates a world of opportunity for content publishers.